The Australian Museum is a heritage-listed museum well-known across the world for its natural history, anthropology and Indigenous exhibitions. Just a short walk from ELC, the museum is the oldest in Australia, established in 1827! This is always a popular excursion for our students and the standout is generally the dinosaur exhibit (pictured)! At the museum students can also learn about the unique cultures of Australia and the Pacific, as well as flora and fauna of these regions. 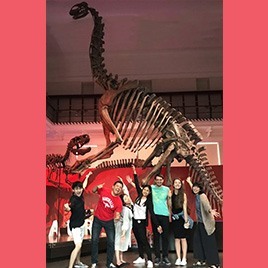 All our activities are guided by an ELC teacher or staff member, so students are able to ask any questions they have about the exhibits and also practise their English together with the group. It’s all part of the learning experience! You can check out photos of our activities on our Facebook page and on Instagram! You can also see a video showcasing our range of social activities on our YouTube channel.